Khan was a 7-time British Open champion. Hashim Khan, one of the greatest squash players in history and leader of the sport’s dominant “Khan Dynasty,” died at his Colorado home on August 18. He was believed to be 100 years old. A Pakistani Muslim who learned how to play squash as a child from watching British military officers play the game at the club where his father worked, Khan won a handful of Indian and Pakistani national titles. He then went on to win seven British Open championships between 1951 and 1958, when he was in his late-30s and early-40s, and also won three U.S. Open and three Canadian Open tournaments. After retiring from the elite squash circuit, Khan moved to the U.S. to coach and teach the sport, and continued to play into his 90s. In 2009 he was the subject of the documentary film Keep Eye on Ball: The Hashim Khan Story. Khan had 12 children, seven of whom became competitive squash players. 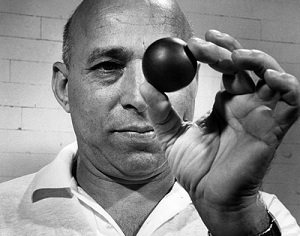 His oldest son, Sharif Khan, won 12 North American Open titles.